Thu, Mar 22, 2018, 12:58 pm SL Time, ColomboPage News Desk, Sri Lanka. 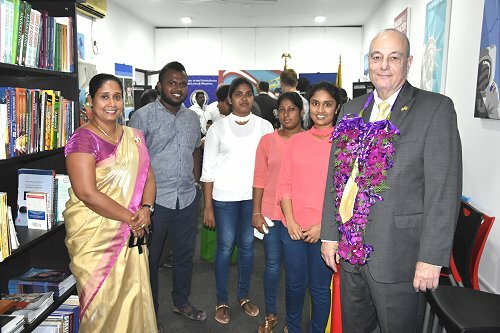 Mar 22, Colombo: The U.S. Embassy in Sri Lanka launched an American Innovation Hub (iHub) in the southern city of Matara on March 21, 2018 in partnership with the Matara District Chamber of Commerce and Industry. The iHub will provide employment and leadership skills for young people, promote English language learning, encourage study in the United States, and introduce the local community to American culture and values. "The American Innovation Hub will inspire creativity, innovation, and entrepreneurship in the Southern Province through technology and engineering programs," said U.S. Embassy Public Affairs Officer James Russo at the opening. "As we celebrate our 70th anniversary of partnership with Sri Lanka, we are delighted to expand our people-to-people connections in Matara." Mr. Russo and President of the Matara District Chamber of Commerce and Industry Metta Widanagamachchi inaugurated the iHub, which is located in the Matara Chamber of Commerce building at No.149, Hakmana Road, Matara. The iHub is open to the public from Monday to Friday, 9:00 a.m. to 5:00 p.m. and Saturday, 9:00 a.m. to 12 noon. The iHub offers thematic programs, all free of charge, and a selection of U.S. books and DVDs.